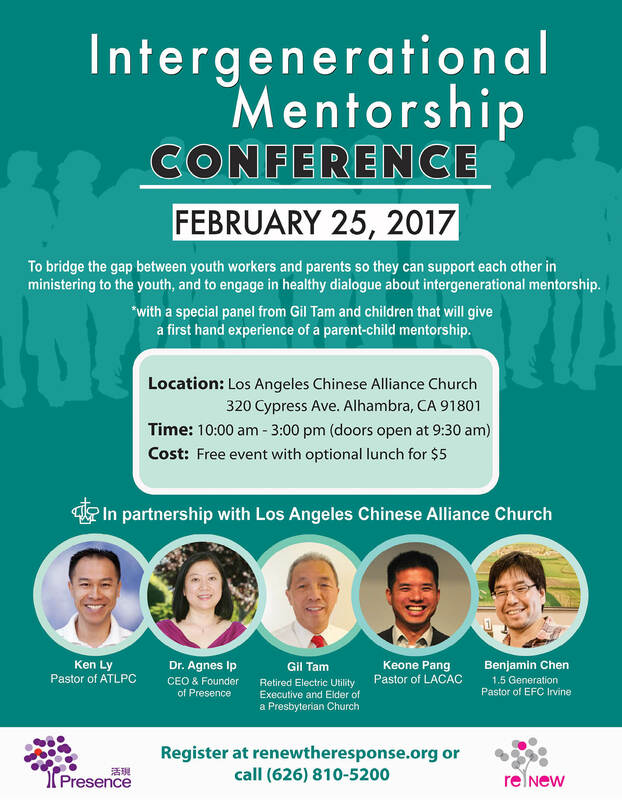 Presence will be hosting the Intergenerational Mentorship Conference (IMC) from 10:00 am-3:00 pm at LA Chinese Alliance Church in Alhambra, CA to reflect our ministry theme over the past two years. During this conference, we will be gathering parents and youth pastors to come together and discuss how to join efforts in serving the youth generation and will include panels and messages from various speakers. The conference is free with an optional $5 lunch, as the event will be an all-day event. Gil Tam & children that will give a first hand experience of a parent-child mentorship. A chance to ask youth pastors about what they envision for youth ministry. Our CEO and Founder, Dr. Agnes Ip, sharing how to mentor across different generations and cultures through case studies and other examples. *We can provide a Mandarin translator if there are 10 or more people interested for the event to be in Chinese.